Lay the 12 jello shot cups out on a cookie sheet and set aside. Add the pineapple juice to a medium saucepan and heat under medium heat for 5 minutes. Do not allow the juice to boil. Remove from heat. Open the pineapple gelatin box and pour the contents into a medium mixing bowl. Pour the hot pineapple juice into the bowl with the powdered gelatin and whisk until dissolved. Add the cold Malibu rum and stir well. Pour the gelatin mixture into the jello shot cups, filling almost up to each rim and return the cups to the cookie sheet. Chill overnight or for at least 4 hours. Once the gelatin has set, you can place lids on the cups. 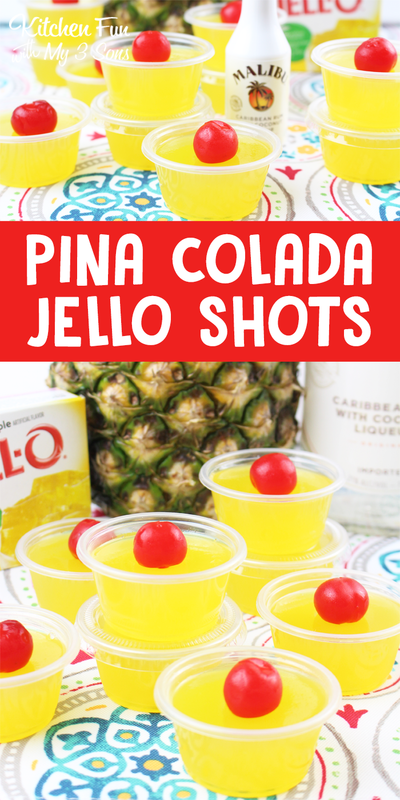 Optional: Before serving, add a fresh pineapple wedge and maraschino cherry to each cup.